I feel very blessed to be a Reiki Master and connecting students to the universal energy, through the sacred act of ‘attunement’. This process is beautiful and powerful and connects a person for life with the loving energy of Reiki. 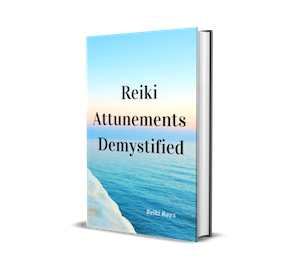 As with a Reiki treatment, the person receiving an attunement will experience very different things to another person. Some may see colours, feel warmth or tingles, or even see and hear grand masters or other spiritual entities. As a master, I cannot tell a student what they are going to experience. Recently I attuned a beautiful student to Reiki Level 1, and during her 3rd and 4th attunement she had the most magnificent experience. She was given her very own symbol. During the discussion after the attunement process ‘Carlie’ was telling me about this design that came through to her, and so she drew it for me. It was a beautiful symbol. My advice to her was this is her own symbol to be used on her family/friends/clients and for her to meditate on the symbol to receive further information on how this symbol can be used during the Reiki she gives. I told Carlie how very, very special it was to receive a symbol of her own, especially in a Level 1 attunement. I’ve never had a Level 1 student channel a symbol before; although I’ve had a beautiful soul during her Master attunement, channel numerous symbols, but never before in level 1. This demonstrates that the attunement process is very different for each and every student. Its unique, it’s personal and it’s very sacred. In Usui Reiki we know there are 4 traditional symbols, and yet this does not exclude non-traditional symbols from being used or incorporated into our Reiki treatments. I personally feel if someone has channelled a brand new symbol (especially during their attunement) this symbol is sacred to them and is to be used by them when giving Reiki. I feel it’s a glorious gift from Reiki and although not traditional, it’s been given to them for a reason and should be embraced and utilised. The attunement process is about connecting a student to the life force energy, the Reiki energy, and so if symbols come through during this initiation process, that is powerful and a sign the student has their own personal symbol to use, and should use, during Reiki. I trust this gives you some food for thought about non-traditional symbols and the attunement process.